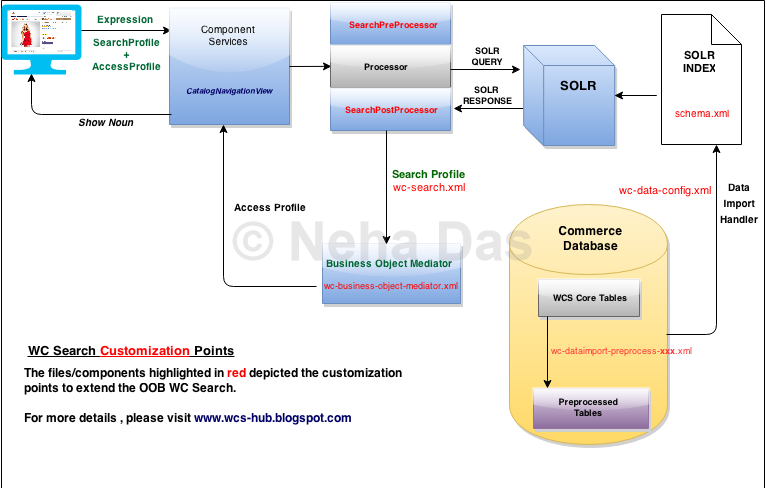 A simple Mind map which depicts the commonly customized files/components with their purpose while extending the WC Search. A query preprocessor modifies the native SolrQuery object right before it is sent to the Solr server for processing. The custom query preprocessor needs to be mapped in the wc-search.xml. A query postprocessor modifies the physical DataObject, SolrEntityContainerImpl, immediately after the QueryResponse is returned from the Solr server. WebSphere Commerce search uses search profiles to control the storefront search experience at a page-level. Search profiles group sets of search runtime parameters such as search index name, search index fields, expression providers and result filters, paging and sorting, and search feature configurations such as text highlighting, facets, and spelling correction. Search profiles are defined in the WebSphere Commerce search configuration file (wc-search.xml). The business object mediator maps physical search index fields to their corresponding logical fields in the CatalogEntryView noun. Custom physical index fields can be mapped by using the UserData fields. The preprocessing tasks are controlled by the wc-dataimport-preprocess XML files. The files contain table definitions, database schema metadata, and references to the Java classes used in the preprocessing steps. Those files are invoked by the di-preprocess utility, which extracts and flattens WebSphere Commerce data and then outputs the data into a set of temporary tables inside the WebSphere Commerce database. The data in the temporary tables is then used by the index building utility to populate the data into Solr indexes using Solr's Data Import Handler (DIH). Typically, WebSphere Commerce data is stored in a relational database. In WebSphere Commerce search, another repository also stores WebSphere Commerce data. That is, the product information is stored in a search index for searching purposes. Most of the data that are stored in the search index is extracted from the relational database. Similar to the database schema, the search index also contains a schema. 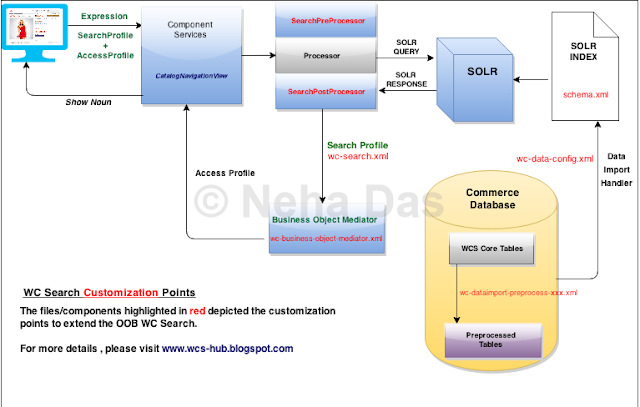 The fields that are defined in this schema are used by WebSphere Commerce search. By customizing the schema.xml , we define fields in the search schema that store the data to be searched. Once the new fields are defined, the mappings must be configured for the fields to the database schema. I hope you will find the mindmap really useful. As always , please feel free to add your comments and suggestions.